Summary for the Busy Executive: Bay mir bistu sheyn. Mark Zuckerman studied with Milton Babbitt at Princeton, and like Babbitt (though unlike many of Babbitt's opponents), is happy with a wide range of music. He's also worked as a commercial musician (sax, keyboards, arranging), written on jazz, and founded (and composed for) Di Goldene Keyt, a vocal ensemble specializing in Yiddish song. His original composition, like Copland's, has two primary strains: easy and hard. Certainly, almost all the music here, even the ambitious music, aims at accessibility. It's easier to write "profound" than "clear," just as you can indulge in mind-altering drugs while participating in a bull session but not while trying to say exactly what you mean. Successful commercial musicians necessarily possess the virtue of clarity. Of the "easy" pieces, Shpatsir and Theme Song, fare best. Shpatsir (Yiddish for "stroll") reminds me a bit of Percy Grainger's Morris tunes, with the same kind of sunny spring in its step. Theme Song arranges, appropriately enough, the signature tune of Di Goldene Keyt, "Mir zaynen do tsu zingen" (we're here to sing). I prefer Zuckerman's vocal arrangement, but that may be because I heard it first. Almost all of Zuckerman's program "comes off." I'd except only the opening track, Introduction and Fugue. It's a piece intended for amateur string players, and writing for amateurs provides composers with their severest test. On the one hand, you can't indulge those flights of fancy that call for (or can be covered by) advanced technique. On the other, amateurs, particularly young ones, rank among the least forgiving critics. They don't tolerate less than one's very best and don't understand that one's very best isn't always possible. I suspect there's a sports metaphor lurking beneath all this. After all, a home run is a home run and a touchdown is a touchdown. In art, you run up against nuances. At any rate, composers writing for amateurs must find simple and inspiring ideas, perhaps the toughest job they can undertake. Introduction and Fugue is simple without being particularly interesting. Furthermore, it could have been written by a lot of people. One looks in vain for a personality in this score. Happily, however, it's an anomaly. "Facelessness" is rarely Zuckerman's problem. The liner notes imply that all the other pieces are "atonal." They certainly may be serial; I haven't checked a score and so don't really know. Nevertheless, I hear tonality – ie, a sense of harmonic "home" – in every single one of them. If you can take a piece like Copland's Piano Variations or Bernstein's Halil, you should have few or no problems with Zuckerman. Zuckerman's outstanding talent, apart from his craft, is his original and incisive sense of melody. He comes up time and time again with memorable gestures and ideas which can carry a listener through a long, complex piece. Just as important, if this is indeed an atonal score, he avoids the post-Wagnerian melodic clichés of atonal music. Out of the Wilderness plays this up in spades – a suite of five movements all based on one theme. Zuckerman likens the piece to a passacaglia. Each movement also consists of the theme continually varied, and yet Zuckerman never runs out of ways to grab us by our lapels. I particularly enjoy his teasing diatonic harmonic implications from his chromatic theme. Furthermore, Zuckerman labels individual variations within movements according to how he regards their character. I don't agree with most of his designations, but more significantly he writes the piece not simply as a neat puzzle (although I happen to like puzzles), but as something that works for emotional expression. In that, he succeeds. Zuckerman transcribed the second movement of the String Quartet for string orchestra and titled it Shir Kinah ("song of lament," or "elegy"). He composed it in 2006, in commemoration of the 9/11 massacres. Like Barber's Adagio, it assumes a different character in a different medium. I like the string orchestra version very much, but I miss the surrounding context of the quartet. Normally, I'm not a fan of music or art inspired by unfathomable horrors, but Zuckerman's elegy – to put it crudely – works. Perhaps the distance of five years has helped make a difference. The piece has humility and humanity both, a genuine empathy for lives lost. I find it beautiful. The String Quartet itself Zuckerman wrote for Milton Babbitt's 90th birthday. At roughly 36 minutes, it's the longest and most ambitious item on the program. It has four movements: Sonata; In Memoriam September 11, 2001; Scherzoid; Small Fugue. Again, I don't find it either atonal or twelve-tone. To me it works like most modern pieces – high dissonance but with an underlying tonality and a traditional phrasing, based on song and dance. One holds onto an argumentative or narrative thread rather than adjusts to stasis or isolated bursts. However, like the Bartók quartets, it's hard to know. I've been listening for the past week, and while the score made sense from the outset, I feel as if I will discover a lot more as I continue to listen. "Scherzoid" is the most digestible and the most fun. The "Small Fugue," despite its title, takes up a third of the quartet. Zuckerman writes a piece so compelling, however, that I want to listen to it again and again. Consequently, rather than talk about things I don't yet understand, I want to leave off here with a very strong recommendation. The orchestral performances are acceptable. I wanted a stronger, richer string sound than the Seattle Sinfonia gives me, but knowing how much time is budgeted for most contemporary music, that's not really surprising. Rhythm and attack are a bit loose, resulting in a slightly laid-back vibe at odds with the intensity of Zuckerman's music. Joel Suben never allows the narrative thread to fall, however, and gives you an idea of the stature of most of these works. Both he and the Sinfonia do better in Shir Kinah. 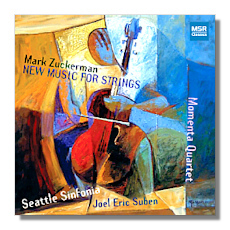 The Momenta Quartet plays heroically in Zuckerman's quartet, without quite getting its measure. How long the players had to learn it, I have no idea, but I'd bet that a year from now their interpretation will grow and mine the score more deeply. Here's to hope and thanks to MSR for taking a chance. Incidentally, Zuckerman's delightful arrangements of Yiddish tunes performed by Di Goldene Keyt are available on The Year in Yiddish Song, Centaur Records 2611.